What was the best way to draw attention to your music shop during the cultural explosion of Swinging London in 1968? 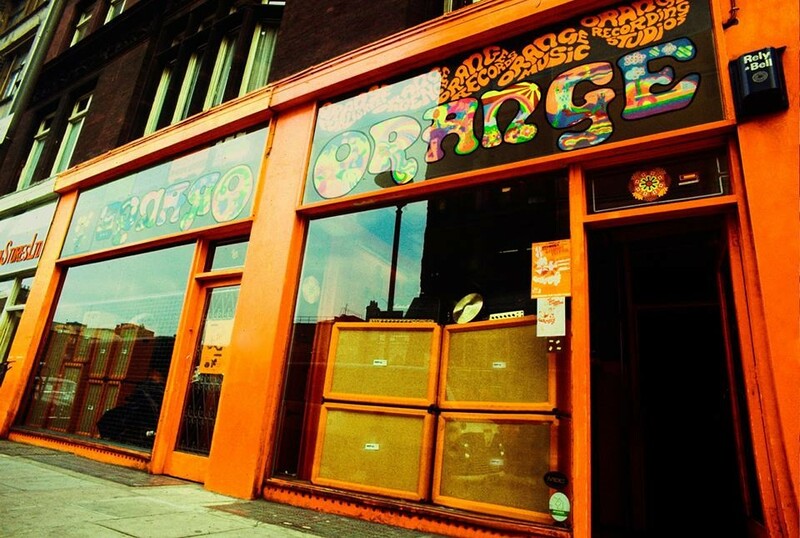 Paint it the most vivid, psychedelic shade of orange possible, and allow guitar luminaries like Peter Green, Paul Kossoff, and Jimmy Page to hang out. Clifford Cooper was a guitarist, amateur electronic engineer, and aspiring record producer, with plans to build a recording studio in an empty, neglected storefront at 3 New Compton Road in London's West End, not far from Carnaby Street fashions or the Denmark Street music shops. The studio itself would be in the basement, for soundproofing reasons, leaving the empty storefront to serve as a hangout. With little funds to spare on advertising, Cooper figured the best way to turn heads would be to paint his shop the brightest, most vivid shade of his favorite color possible, interior as well as exterior, and Orange Recording Studio was created. This drew the ire of his neighbors, attracting both the type of customers he desired and other businesses reviled. While Cooper had acquired some basic recording equipment and experience from his time in the band The Millionaires, having recorded with British legend Joe Meek, the studio business was a tough one, especially with the competition he was up against in London at the time, and struggled to make rent in those first few months. He soon turned that storefront into a retail shop by placing his band's old Vox PA system in the window; it sold that very day, and the first used gear shop in London was born, creating a swapmeet atmosphere for local musicians that favored the odd and quirky to the shiny and new. Cooper attempted to carry popular lines of new gear, but manufacturers and distributors didn't take his business seriously, as he and his employees preferred t-shirts and jeans to the jackets and ties of the Denmark street shops. At first a stumbling block, necessity would prove to be the mother of invention. 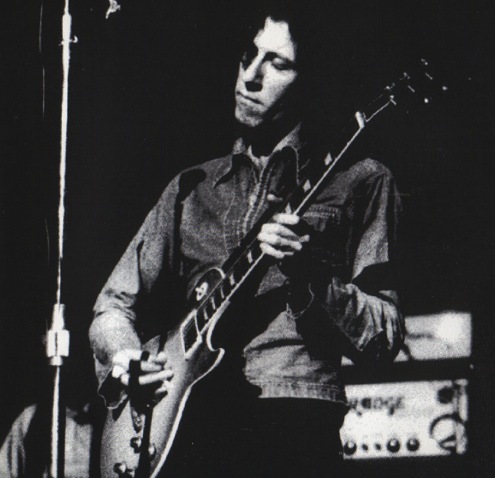 One day in October of '68, Peter Green, former guitarist of John Mayall's post-Clapton Bluesbreakers and leader of the new group Fleetwood Mac, was hanging out at the Orange shop with his road manager, and mentioned they needed a full backline for their upcoming U.S. tour. Cooper, seizing an opportunity, offered to supply it... tube heads powerful enough for guitar and bass, speaker cabinets, and reverb units. While Cooper had a bit of electronics knowledge, having built small amplifiers in the past, he needed help to accomplish this, and with only one month before the tour began, he reached out to a friend. 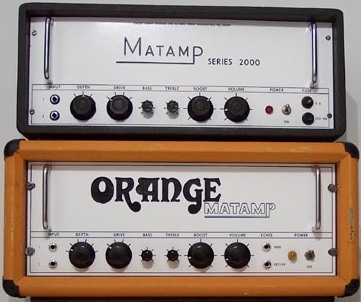 Mat Mathias had been building amps in the back of his wife's retail shop since 1962 under the brand name Matamp, an evolution of his older RadioCraft company started in 1945. 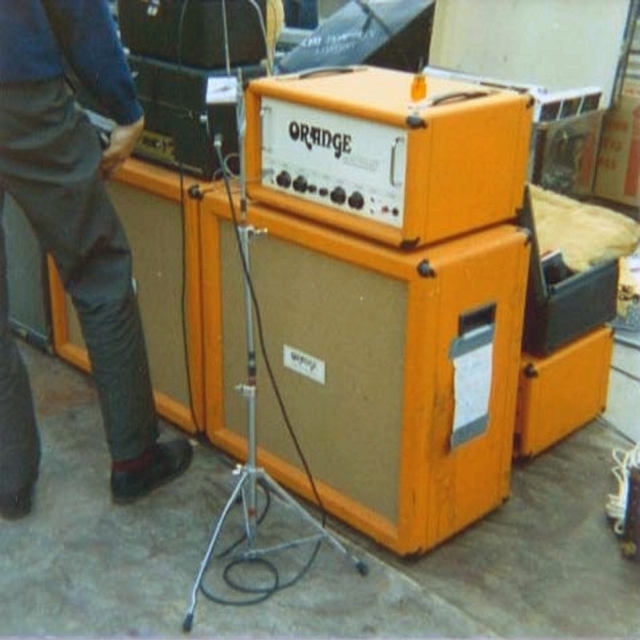 The Series 2000, a simple and pure 20-watt head, used a unique bent aluminum chassis that slid into a wooden cabinet like a window frame, and although very limited in quantity, was considered extremely high quality. 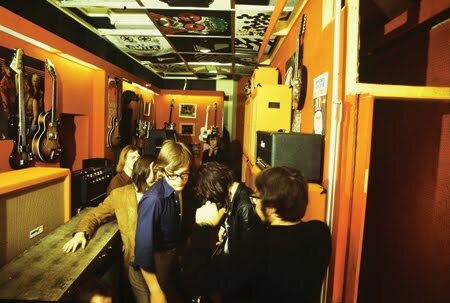 Cliff Cooper reached out to Mathias about building 100-watt heads for Fleetwood Mac, a combination of Mat's current designs and Cliff's ideas, sub-contracting him to handle the electronics while the wooden cabinets would be built at the Orange shop (and covered in orange tolex, naturally). 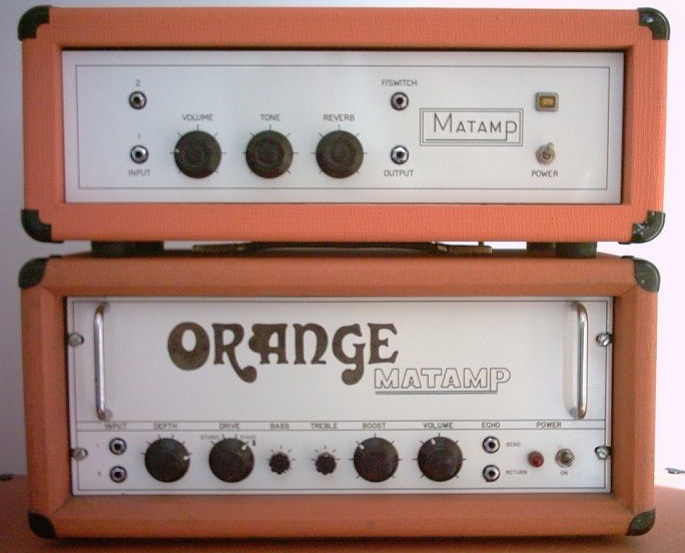 Mathias agreed, under the condition that the Matamp name be displayed on the front panel, along with the large, bold Orange logo (Cooper insisted on a logo that could be seen easily on a large stage). 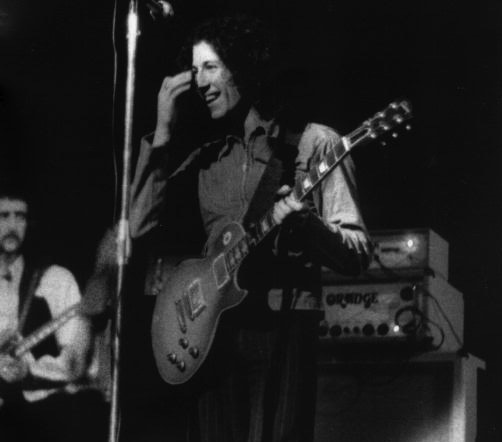 When Cooper and Mathias asked Peter Green how he'd like these new amps to sound, he replied, "I want it to sound sweet, but not like treacle. Like honey." The design used a pair of high-powered 6550/KT88 tubes to reach the 100-watt goal, while keeping the tone clean and sweet, as per Greeny's desires. They were also some of the first amplifiers to include echo send and return jacks on the front panel, a very primitive passive effects loop. The six prototype heads, sixteen speaker cabinets, and a couple of spring reverb units were completed in just under a month, 28 days to be exact, and Mathias hit the road with Fleetwood, keeping the amps maintained and running smoothly. 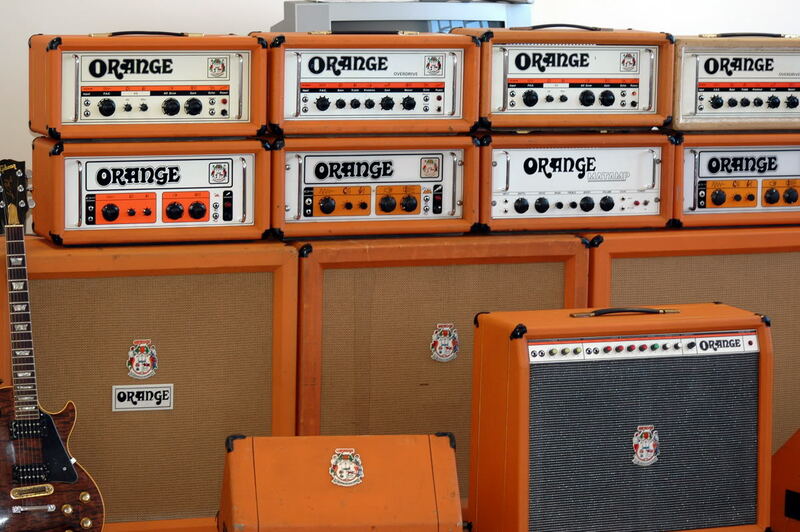 After the tour, production began on a full lineup of Orange/Matamp designs. Mathias realized while traveling with the band that they'd have to switch from the aluminium chassis to steel in order to withstand the rigors of the road, and while he was busy building the amps, Cliff Cooper was making friends with everyone on the London scene. From '69-'72, three amplifier models, along with a spring reverb unit, slave amp (a 100-watt solid-state power amp), and 4x12" cabinets were manufactured; the OR100, derived from the original 100-watt prototypes but now using four EL34 power tubes for a more popular dirty tone, the ORST 50-watt "student" head, and the OR200 bass head using four 6550/KT88s, competing on every level with Marshall, Hiwatt, and other British amp makers of the day. 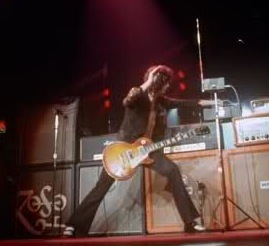 The oversized speaker cabinets used Celestion "Greenback" G12M and G12H speakers, and sounded as huge as they looked. 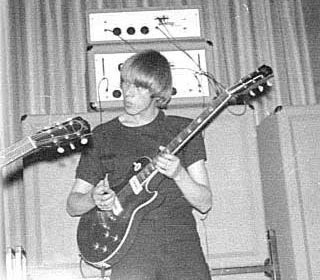 Peter Green (left) and Danny Kirwan (right) of Fleetwood Mac, with Orange heads and reverb units on top. 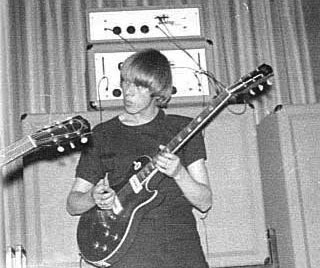 Peter Green, along with fellow Fleetwood Mac members Danny Kirwan, Jeremy Spencer, and John McVie, were still the most prominent Orange endorsers, with Andy Powell and Ted Turner of Wishbone Ash sporting an Orange backline, and Paul Kossoff of Free using them occasionally to great result, as seen here. 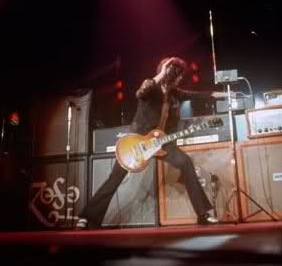 Jimmy Page would become one of the most well-known Orange players beginning in 1971, using Orange heads along with his Marshalls throughout the '70s and still to this day. An OR200, one of two built for Page and seen on The Song Remains the Same, was found in a garage in New Jersey, where it literally served as a rat's nest for years. It was cleaned up and sold on Ebay in 2009 by our local music store, the Rutherford Music Exchange, for $30,000.00 U.S. to an anonymous collector. 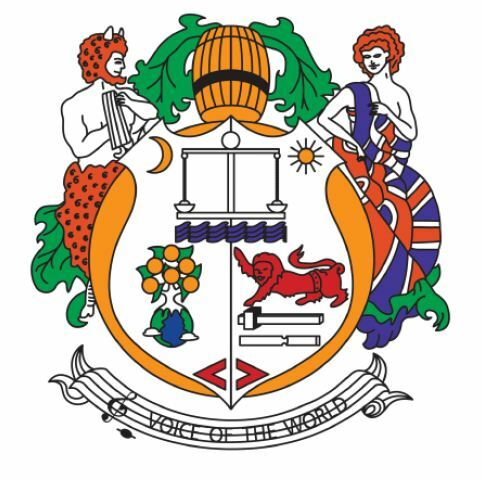 The front panel engraving and Union Jack were added later by Orange after a factory modification (note the depth of both the oversized head and speaker cab). Although never official endorsers, Black Sabbath filmed one of the first and most iconic music videos ever using a full Orange backline, creating a cult-like Orange following among Sabbath-inspired stoner rock bands for decades to come, including Sleep, The Sword, and Wolfmother. Black Sabbath's Paranoid video, my personal introduction to both metal & Orange. 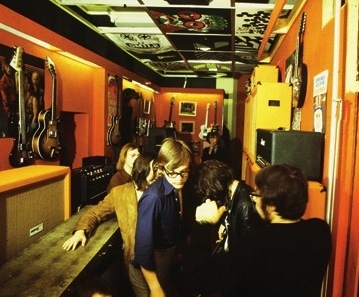 Along with the success of their amplifiers, the Orange Shop became even more popular, as Cooper began importing Fender and Gibson guitars from America, providing Andy Powell of Wishbone Ash with the first of his trademark Gibson Flying Vs. It's notable that Eric Clapton purchased a very rare lefty Stratocaster in Olympic white finish at the Orange shop on September 17th, 1970, which he planned to present as a gift to Jimi Hendrix later that night; he never did meet with Jimi, though, and Hendrix passed away in the morning of the very next day. 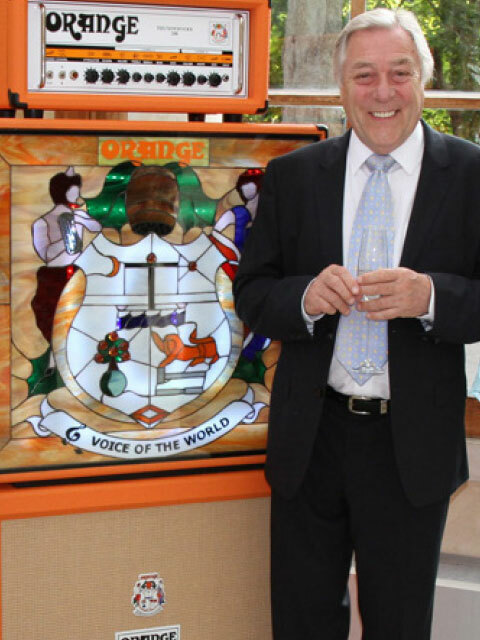 Following the same entrepreneurial spirit that started the Orange company, Cliff Cooper began making deals with many venues and production companies, and his brilliant marketing led to Orange becoming the official backline provider for the BBC's outdoor events, as well as festivals like Reading, Isle of Wight, and even the 1972 Olympic Games in Munich, leading to the company slogan "Voice of the World" and a Coat-of-Arms-style crest logo. By the end of '72, Orange was outselling Marshall in Europe (there's even a rumor that Marshall began producing more orange-covered amps than just the usual custom orders in an effort to compete), but Mat Mathias' expanded amp factory could not keep up with demand, as many backorders accumulated. Mathias insisted on maintaining his meticulous, painstakingly high production standards at the sake of quantity, but Cooper wanted more cost-effective production methods and higher numbers. The two amicably dissolved their working relationship, with Cooper calling Mathias "A real gentleman for whom I have always had nothing but the greatest admiration." 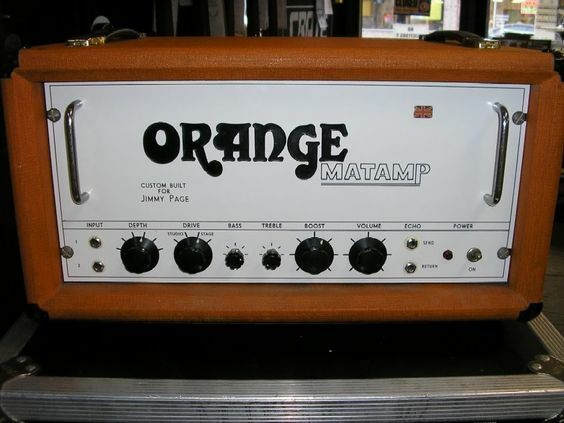 Mathias would bring back the Matamp brand and continue building handmade amps until his death in 1989, while the company has carried on under various owners since. 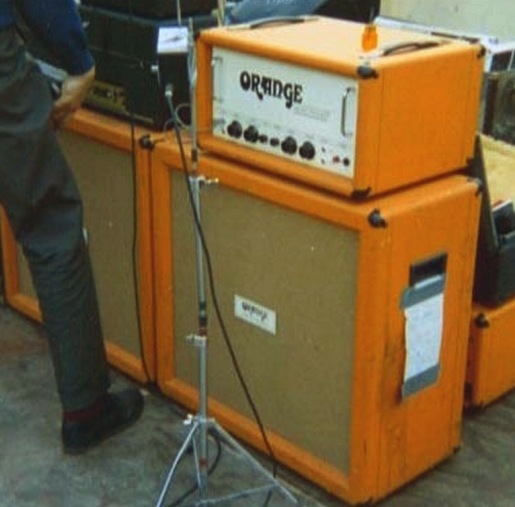 The next phase for Orange came when R&D engineer John James designed the "Graphic Valve Amplifier", nicknamed simply "Pics Only". The unique faceplate of this model used graphic images to describe the knob functions, inspired by English countryside road signs, and became instantly polarizing for it's quirky new looks. 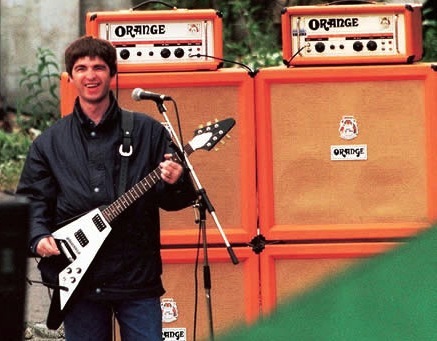 It was also the first Orange amp available in a combo format, a 2x12" with Celestion Greenback speakers. By the end of 1973, production had moved to a larger facility and an extremely efficient assembly line, resulting in 20-30 amps manufactured per day. 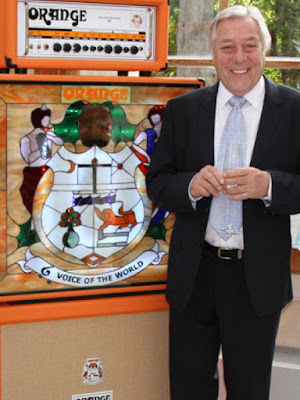 Orange began exporting to the U.S. for the first time, and the "Pics Only" head was slightly revised, both internally and cosmetically, adding text along with the graphics to avoid confusion (referred to as "Pics & Text"). The model names were also changed to reflect exaggerated output power rather than the original conservative RMS wattage ratings, upping the ante of the OR120 (120 watts) and OR80 (80 watts), again in both head and combo formats (the circuits were essentially the same, and this was mainly done to get a leg up on the competition). The Graphic design amp would become the most popular Orange ever, and the most widely-found of all the vintage models due to increased production and exporting. 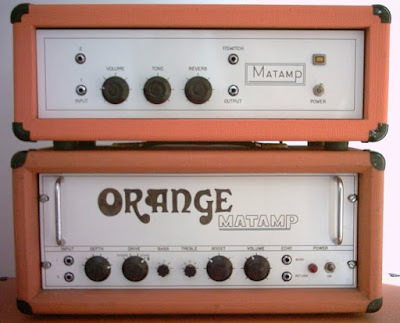 While some prefer the sound of the original Orange Matamps, there is no denying the influence of the Graphic series in the mid-70s and beyond. In 1975, a line of combos and head with Hammond spring reverb and tremolo called the Custom Reverb Twin, aka "Hustler", was designed to compete with the ever-popular Fender Twin Reverb, and combined a pristine clean tone with the fat crunch Orange had become known for, but with a new look of smaller multicolored knobs and a grey speaker grill. 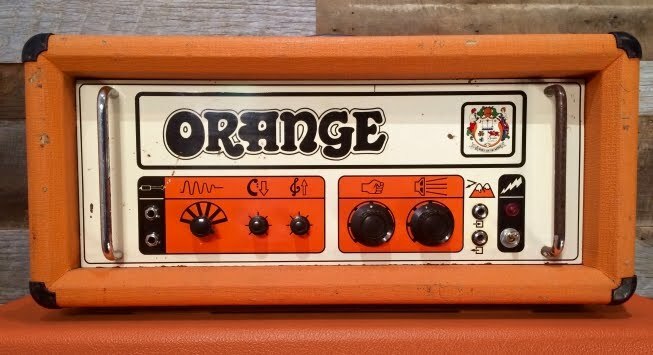 1976 saw the introduction of the Overdrive line, based on the popular Graphics series but featuring a Master Volume control to allow cranked tones at lower volumes, which was becoming increasingly in vogue for amp design everywhere. Firmly established by the mid-70's as a premier instrument amplification company, Cooper set his sights on more diverse territory, and began experimenting with mixing boards, DJ equipment, solid state amps, and even digital processing, forming OMEC and developing a digital guitar amp (the first ever of it's kind and years ahead of its time), but never reaching the same heights of success as his early amp lines. By 1979, the original Orange shop was demolished, along with the rest of the storefronts on New Compton street; Orange would lay relatively dormant throughout the 1980s and early '90s, with Cooper building only small numbers of amps on a special order basis. 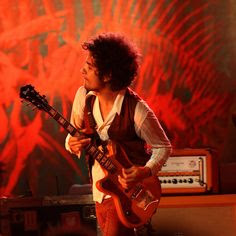 Gibson attempted to revive the Orange name in 1993, but were not successful, and gave the rights back to Cooper in '97. A reawakening was about to begin. 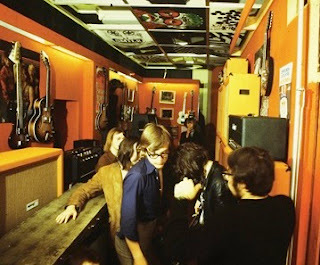 The Orange line, circa 1978, including PA speakers, mixing board, turntables, and of course guitar amps. Front: PA monitor wedge, Custom Reverb Twin "Hustler" 2x12" combo. 1998 would witness a rebirth of the Orange name, with Noel Gallagher of Oasis leading the way, working with Cooper and new technical director Adrian Emsley to combine the best of the early years with the needs of current times. Noel initially used the Overdrive heads of the late '70s, but desired more crunch; this led to the OTR 80 and 120 heads, bearing a striking resemblance to those '70s classics with improved circuitry and quality. The AD series was launched soon after that, featuring Class A electronics and EL84 tubes, and receiving much critical acclaim and success; models included the AD30 head, AD30R 2x12" combo, and AD15 1x12" or 1x10" combo. An EL34-based AD50 head, switchable from 50 watts Class AB to 30 watts Class A, would combine the old with new designs, and the monster 200-watt AD200B bass head, utilizing four 6550/KT88 tubes, payed homage to the original OR200 (my favorite bass amp ever, personally). with an AD30 early on and a Rockerverb head here. Orange would follow this rebirth with several successful designs, incorporating channel switching into heads and combos, introducing the Rockerverb series, Tiny Terror mini tube heads and combos, Orange Crush solid-state practice amps, and many variations of its older designs, all with the signature orange tolex that started it all in 1968. Cooper is back to his great marketing tricks, bringing in the endorsees left and right, including Billy Gibbons of ZZ Top, John McVie of Fleetwood Mac (again), The Eagles of Death Metal, Devon Allman, harder-edged bands such as Slipknot, Down, Mastodon, the Deftones, and many more. Clifford Cooper's "Voice of the World" mission statement is alive and well, and stage backlines are psychedelic orange once again, everywhere. The man, the myth, the legend, Clifford Cooper. 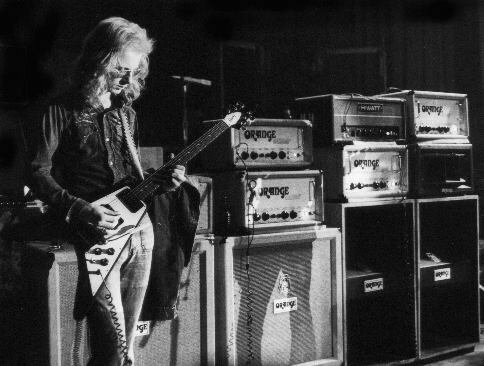 Wishbone Ash's all stuff were stolen in US back in 1970's. Aside from this it does electronic impacts like bending, melody, re-verb and control over realistic equalizer.